Despite having a week to come up with a great story…I’ve got nothing. See, you have to have at least that kernel of truth in there. I’ve only been fishing twice in my life, and neither was a good experience for me. The next time was on a Co-Op preschool field trip to the Trout Pond. The pond was really a shallow cement pool with nasty looking water in it. We helped our children drop a pre-baited hook into the water and waited about ten seconds until one of the many starving trout attacked it. Then a “fisherman” that worked there took it off the hook and wrapped it up for us. Of course that reminds me of the time my dad brought home a monster sized fish from somewhere and insisted that I clean it for him. That poor dead fish and I looked each other in the eye and I lost it. It was the first of many times that I became a vegetarian. I’m sure a better person than me could write a heck of a story about any of those…but I’m still waaaay too traumatized. You haven’t been fishing unless there are a few crocs and sharks about Susan… good deal on not eating that trout though. Oh I hear you baby! Its just down right nasty! I also did not go fishing so to speak! And I would not be cleaning that fish either! Fishing is not on my list of fun things to do! However, I do love to eat fish but only after someone else had done the catching!! I’m with you on the fishing. Yesterday on Iron Chef the competing chefs had to catch their own live black fish out of a tank and butcher before they could cook. Chef Mourimoto kept commenting on how hard they were to catch. . .duh! We’re in the ‘same boat’ on this this week. Fishing is NOT my forte either. 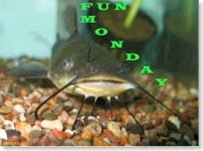 Loved your Fun Monday fish tale. Don’t blame you. Have you ever seen that video on “Funniest Home Videos” where the restaurant brings out a fish that is still alive? *gag* I tried to find a link for you, but couldn’t find one! I’ve never been fishing. No interest in the activity, and I’m allergic to fish. Why interact with slimy creatures just to get a food that will make my throat close up? Yah, I’m with you, except I do like to eat ’em. I will cook the fish, but there is no way I’m cleaning them. I feel the same way about circuses as I do about those fishing places. I think I would have been scarred for life also if I caught a shark!!! I must admit I’m a little wigged out by their eyes. I love teh fact that you use your Creative License in telling stories. My family tried to tell me that it was lying to do that. I proved to them on the Internet that even memoirs are not word for word. Its impossible. Sometimes there has to be a bit of embellishment to even make the story interesting. I’m genuinely, and I mean it, scared of fish. Terrified. who was the friend? The trash can? ‘Cause he’s one of my best friends. That is a rather nice quality being able to write a story from a kernel of truth. My daughter-in-law, the writer, says a story does not have to be literally true to have emotional truth. Luckily, I have never had to clean a fish. I won a fish once that I turned down because of the cleaning dilemma. I am not keen on cleaning fish – which is why I don’t do it anymore! Oh I must agree with the whole fishing thing. Much to much sitting being quite for me, and I haven’t a clue how to clean and prep a fish. tHanks for your advice. It has been hard but it’s beginning to get better. I love the fish story. My family used to go fishing all the time and I still shudder when I remember the only time I ever watched a fish being cleaned! Cleaning fish is yucky. For some reason their beady, little eyes staring at me made me feel something resembling pity for them. Sigh. This totally makes me think of fishing with my dad when I was younger. He has always been into fishing. I remember the first time I caught a fish, and he made me hold it with my finger in the fish’s mouth for a picture. Yuck. And, I had a belt on that was just a piece of rope. Weird thing to remember. I’ll have to find that picture and do a post about it! OMG! So here’s my catfish ! You had him all along and I thought he was at the bottom of the Kiamichi River in Oklahoma.